I am joining in with the Seasons of Home bloggers to show our family/living rooms. 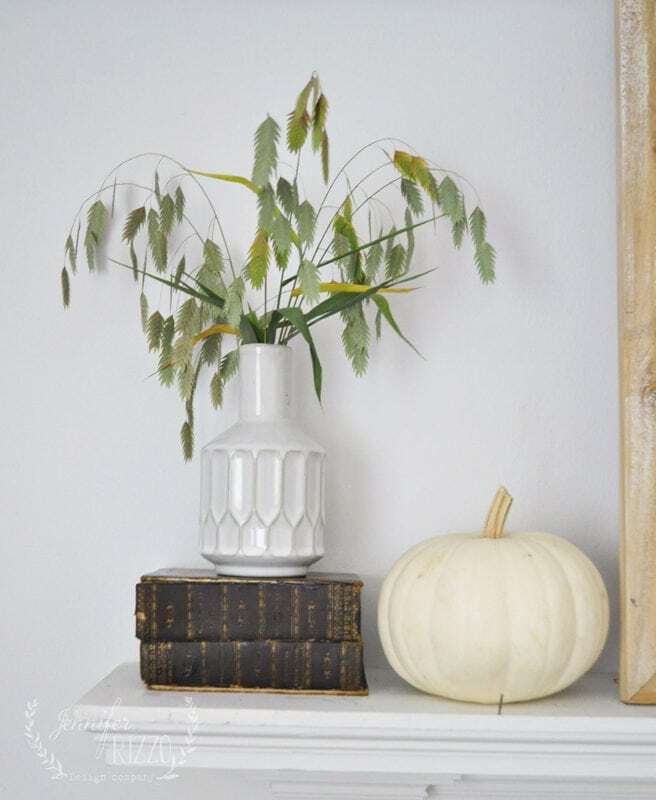 Season change is always a time when I love to revisit my decor, and change things up a bit. 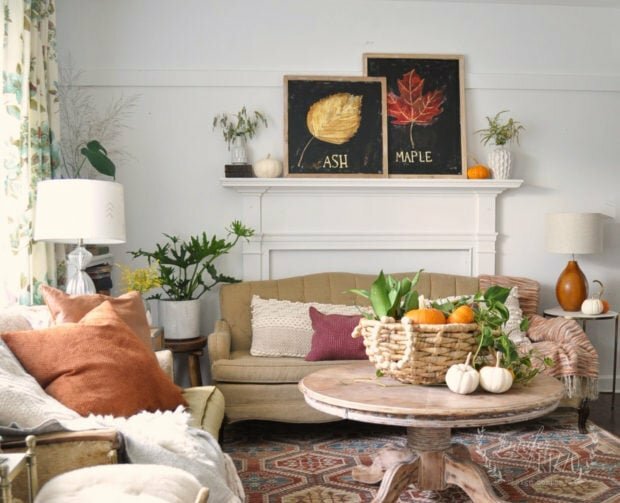 In many of my design clients homes, we are starting to bring in touches of fall as well, and visit fresh furniture layouts. 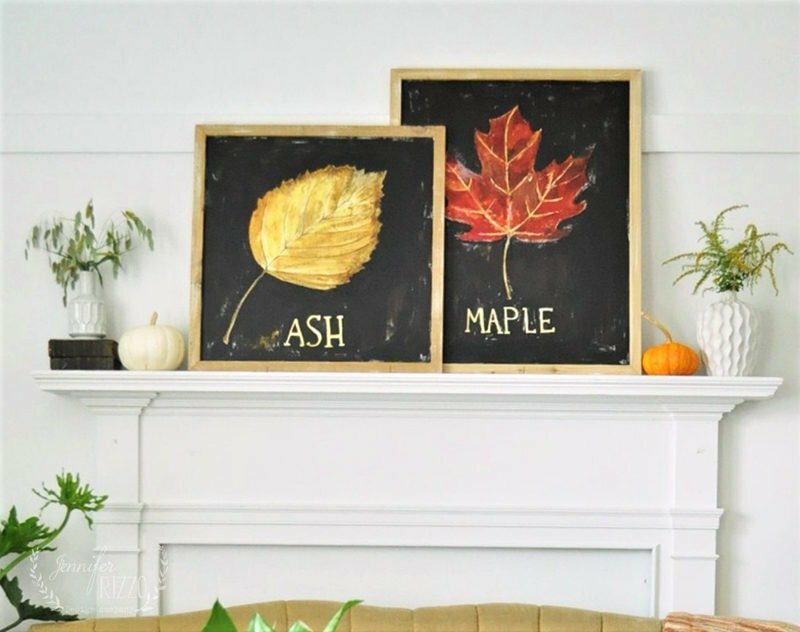 In my own home, I really wanted to add some of my own hand-painted fall art into my decor, and I was tired of the mirror that I’ve had above the mantel forever now. It started when I found this great basket at Homegoods for my coffee table, and I filled it with plants ( a Pothos,and a Snake plant). 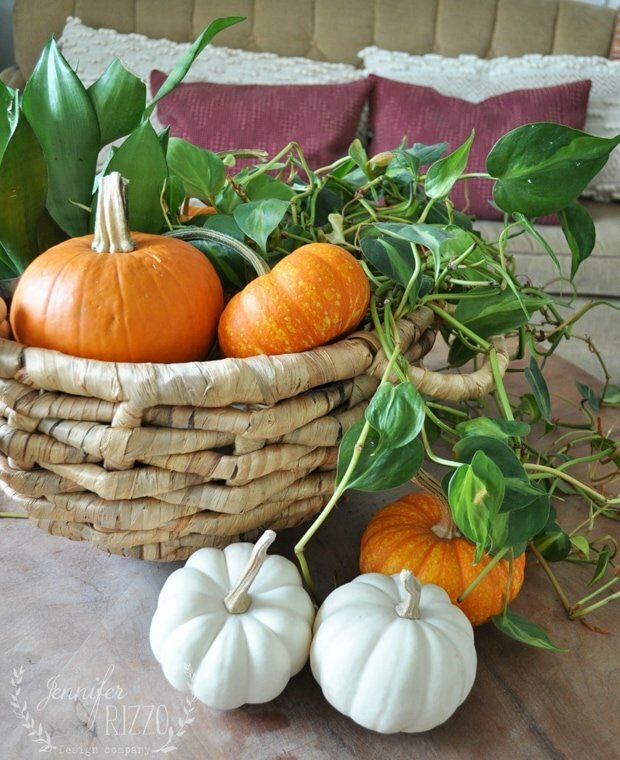 I tucked a few pumpkins in for color, and a few wood beads, and I love how they look against the greenery. You can find a similar basket here, and here, and a set of two here. I love how simple and pretty it is. I liked last year’s decor too. I think every year is my new favorite. I changed out my blue velvet drapes from something a little lighter. This side of the house can get dark in the fall,and I wanted to bring as much light in as possible. I tend to get down in the dumps after the holidays, when winter really kicks in. I am an outdoors, sun and garden person. In reality, I probably have SAD, so bringing in as much winter sun as possible really helps. I am really going to up my plants this year too. 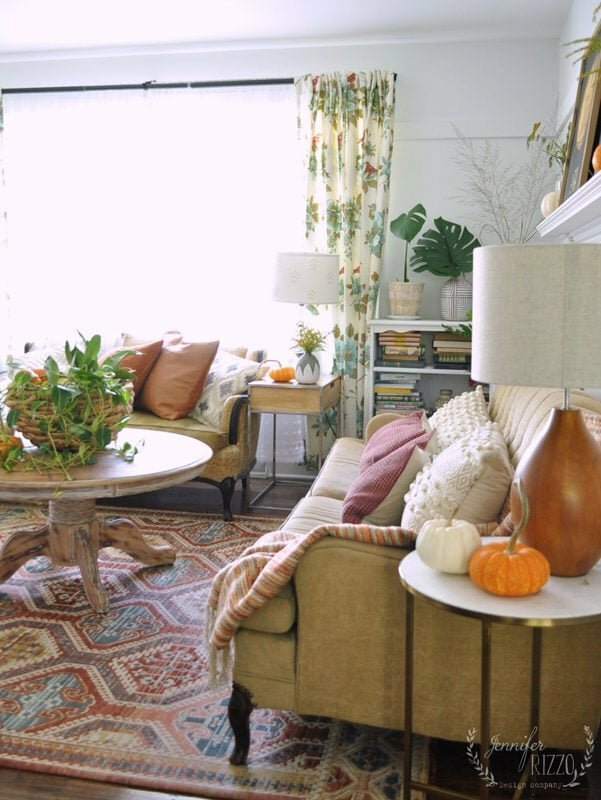 I love the curtains, because thought they are a floral pattern, I felt like the colors were fall-ish, and they went well with my rug from Target. They don’t have it anymore, but this one from Wayfair is very similar, in fact, I almost like it better. 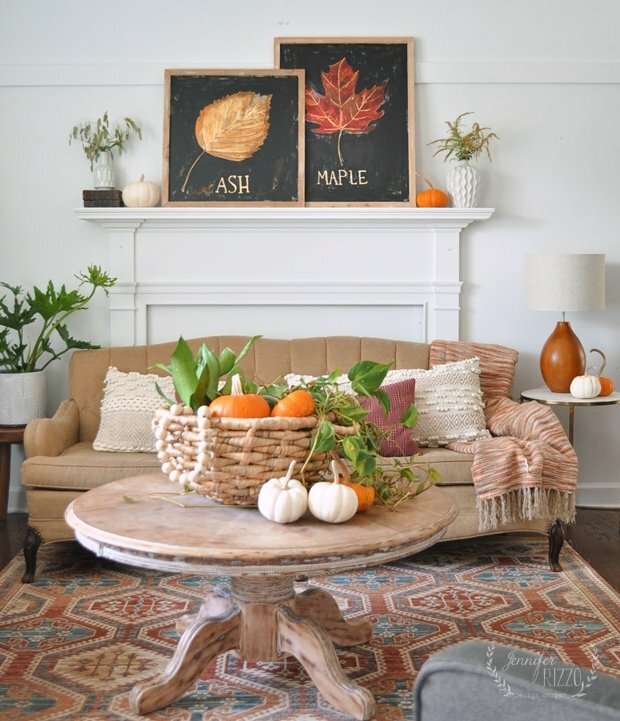 I added a few pumpkins, and a fall throw to bring in some color, and fall texture. I decided to keep my mantel simple, and just add the new art pieces, and a few pumpkins and grasses. You can find pillow versions, and canvases of these prints here. I decorated a lot with grasses from my yard. This is Quaking grass, and I love how the ends turn a pretty golden yellow. Thank you so much for joining me for a little tour around my living room! 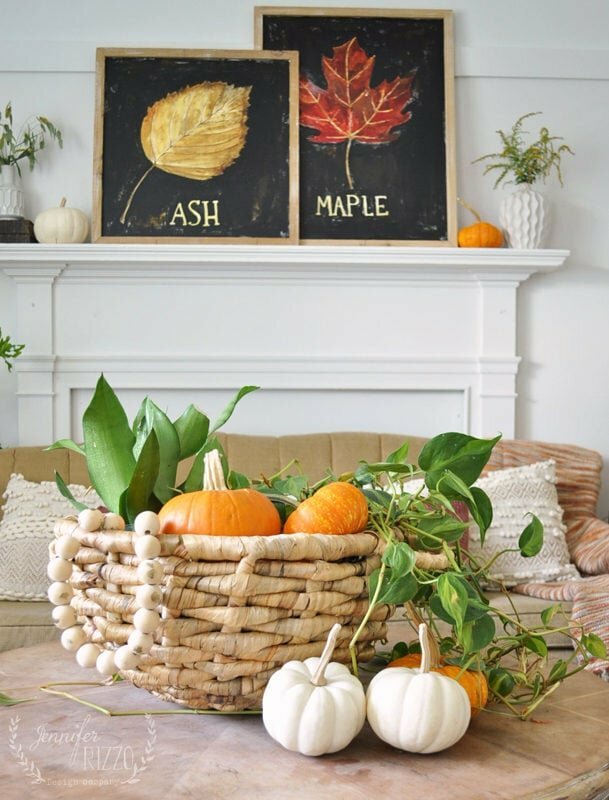 Make sure to visit the other bloggers sharing their fall decor! If you love boho style. You can watch a video of how to make a decorative paint poured bowl here. 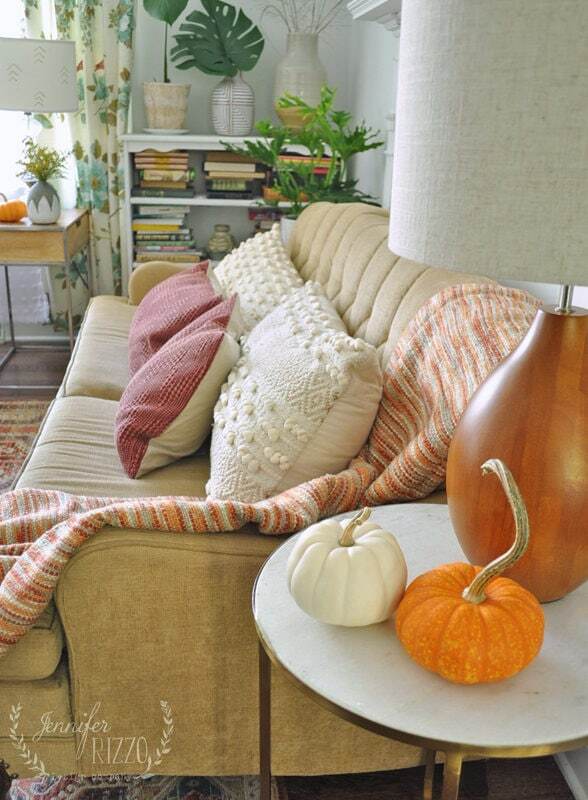 Love your living room, the colors are so inviting and just speak fall. I am such a lover of orange, so this is really my thing. Great tour line up too. I tried to email you about a Christmas Tour but your email was rejected. Can you please email me at astrollthrulife@live.com. I would love to talk to you. Hi Marty, Thank you! I’ll send you an email later this week!